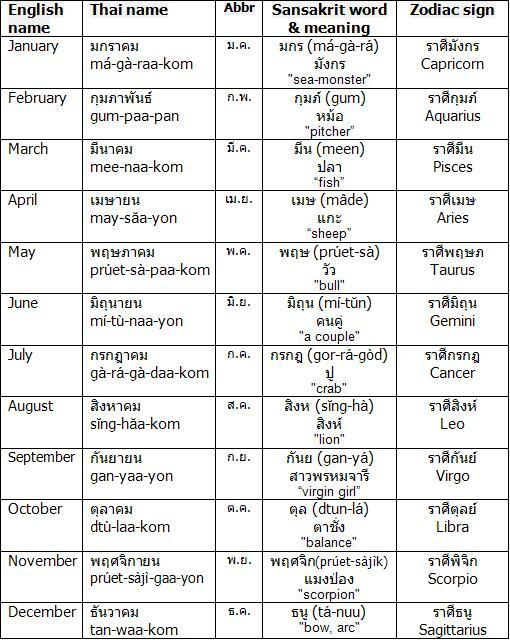 For example: January in Thai is มกราคม /má-gà-raa-kom/ which is derived from the word มกร /má-gà-rá/ meaning “sea monster” also known as the constellation of Capricorn, combined with the word “aa-kom”, so มกราคม /má-gà-raa-kom/ literally means the arrival of Capricorn. May I ask what is the meaning of pror tuk yhang moon di mot laeo? Of course you can ask any questions. I am sorry I am not sure what this part is without seeing the Thai text “moon di mot laeo”. Perhaps you could find them and paste here for me? pror tuk yhang moon di mot laeo? i am disappointed to see the video removed…. do you think you can remake the 12 months topic again? 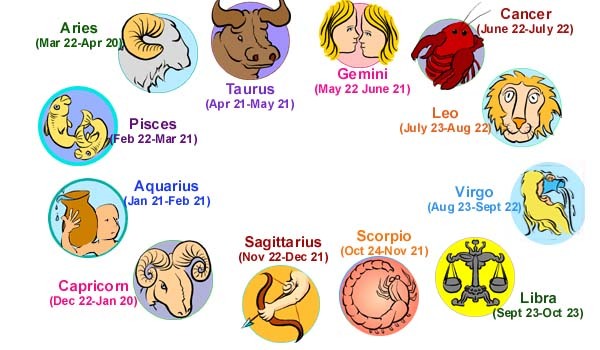 Your image of the signs of the zodiac is similar to most in the west. If I am not mistaken, I have seen horoscopes in Thailand where the cutoff date between the different signs is in the middle of the month. Is this correct or have I just remembered something incorrectly? By the way, since I was born on September 14, this would put me in a different sign in Bangkok than in New York. This obviously also helps to explain the King’s colors and those of other members of the Royal family since The HRM the King was born on a Monday and HRM the Queen was born on Friday etc. Of course in Thai the names of the days of the week are named after the planets (with the exception of Thursday and Saturday since people used to think that those planets were stars), but less people know where the colors come from. Thanks a lot Mod. You are making me more love this language because you do it with so nice teaching. This lesson about months is so interesting. Thanks a lot and I am grateful fir your teaching. This is really interesting. I was finding the months quite hard to learn but this will certainly help. Keep up your great teaching, it is helping me a LOT. I recently moved to Hat Yai and am teaching English here. 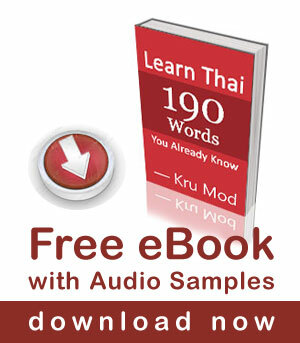 Khru Mod thank u. You are always wonderful, very creative and instructive videos. I recommend u to all my friends. Thank you for answering my sms to u, as u see I am already your fan on facebook. Kwarp khun khrap.